With the inauguration of the 14th presidency, the story of the Indian Republic takes an interesting turn for several reasons. 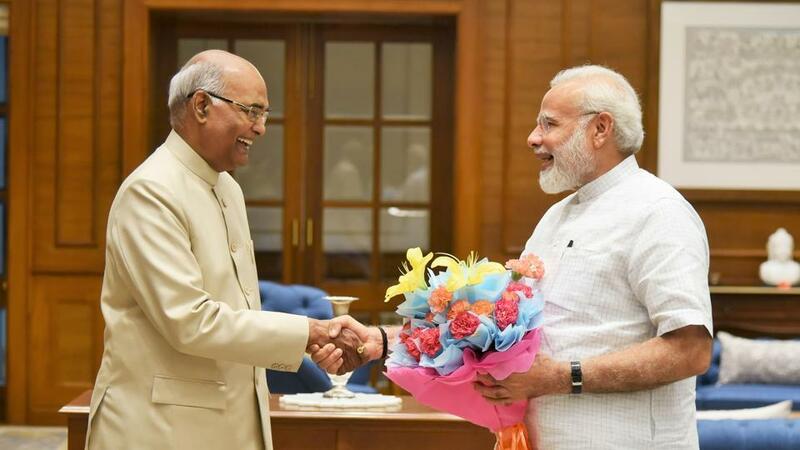 Ram Nath Kovind, the second Dalit to hold the top constitutional position, was sworn in as the President of India by the Chief Justice of India, J S Khehar, in the Central Hall of Parliament on July 25, as the term of the current President Pranab Mukherjee ended. Unlike the United States of America (US), where the President is the head of the state as well as the government, in India, the president is merely a titular head, but at times holds political significance on various controversial issues of the day. For the first time, all the top constitutional posts in the world’s largest democracy will be occupied by individuals who have learned the grammar of majoritarian politics from BJP’s ideological mentor— the Rashtriya Swayamsevak Sangh. This includes the incoming President of India, Kovind; vice-presidential candidate M N Venkaiah Naidu; Prime Minister (PM) Narendra Modi; and Lok Sabha Speaker Sumitra Mahajan. Naidu has been nominated for the vice presidential position by the ruling front. He is set for a smooth sail when elections will be held on August 5. Earlier, these constitutional slots had become a privilege taken for granted by the Congress party due to single-party dominance, except when the BJP government headed by Prime Minister Atal Behari Vajpayee brought in missile scientist, A P J Abdul Kalam as President of India in July 2002. Kovind emerged as a dark horse even as the Indian media speculated intensely over a dozen names for the occupant of Raisina Hill. The selection of Kovind displays PM Modi and Shah’s penchant for surprises, whether it was Yogi Adityanath as the Uttar Pradesh Chief Minister (CM), Devendra Fadnavis as Maharashtra CM or Manohar Lal Khattar as Haryana CM earlier. Kovind has been associated with the Sangh Parivar for more than four decades. He was a grassroots worker then, in the Jan Sangh, the earlier avatar of BJP. Jan Sangh was part of the first non-Congress government headed by PM Morarji Desai in 1977. Kovind himself was personal secretary to Prime Minister Desai. With a full majority in Parliament and ruling 17 Indian states (14 on its own and remaining in alliance), Modi-Shah and the rest of the Sangh Parivar leadership were keen to have their own party leader as President. Kovind won the election with 66 pc votes in the Electoral College comprising members of the Parliament and state legislatures trouncing the candidate fielded by a united UPA candidate, Meira Kumar. Kovind is the second Dalit President after K R Narayanan (1997-2002). Kovind had also been BJP Scheduled Caste Morcha chief (1998-2002) and president of the All-India Koli Samaj. During the last few months, several states have witnessed a rise in atrocities against the Dalits by fringe Hindutva forces and cow vigilante. In fact, PM Narendra Modi’s emotional statement, “Shoot me if you want but don’t endanger Dalits,” at an event, shows the BJP’s outreach to the Dalits. The BJP expects that Kovind’s elevation will counter the Bahujan Samaj Party’s influence in Uttar Pradesh and also neutralise the Opposition elsewhere so they cannot brand the BJP as anti-Dalit after the recent atrocities on this caste. It could arrest the disenchantment and alienation of Dalits from the BJP, who had voted for Narendra Modi. With the elevation of Kovind as President of India, the ruling party plans to expand its Dalit support base in the run up to the 2019 Lok Sabha polls and send a strong message to the community. The question is, will Kovind be a rubber stamp President and sign on the dotted lines? Or will he ask the Modi government some tough questions when an opportunity presents itself and rise to the occasion? Will he go by the rule book and uphold the Constitution? He has begun well by promising that he would protect the Constitution when he was nominated. His role will become significant in times of political turbulence. In case the Modi government wins a majority in the 2019 General Elections, then Kovind can relax. But in case it is fractured, the role of the President will be in the limelight. Another significant issue is the relationship with the executive. Earlier, Presidents and PMs have been at loggerheads during the presidential tenure of Sanjeeva Reddy, Giani Zail Singh, Narayanan and Rajendra Prasad. Also, there are cases of Presidents—Pranab Mukherjee, Fakruddin Ali Ahmed, S Radhakrishnan and Pratibha Patil— who have signed on the dotted line. An ardent admirer of PM Modi, Kovind as the Governor of Bihar, had defended the former on the decision to demonetise high-value currency notes of INR 1,000 and INR 500. Kovind has a penchant for staying away from controversy or media limelight. Nobody loves this more than PM Modi! In short, Kovind will be a friend, guide and philosopher— just as any text book on Indian politics would describe the role of the president. Let us wait and watch how Kovind’s presidency pans out over the next five years.